Property insurance majorly provides protection against extreme risks to property, such as fire, theft and some weather damage. This consist of specific forms of insurance plans such as fire insurance, flood insurance, earthquake insurance, home insurance, and so forth. 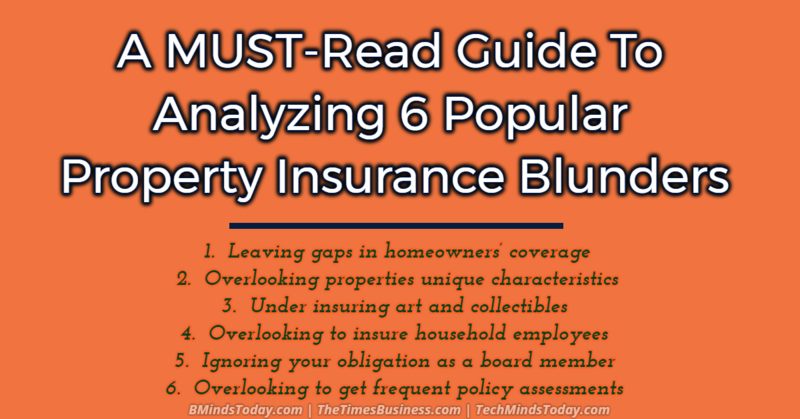 However, getting the right property insurance coverage may not be on your ‘priority’ list of financial plans. But it is very important to assess all of your needs, study specialized policies or policy options, and organize your coverage with other aspects of your financial situation. Property holders or home owners often ignore some facts when it comes to understanding the significance and factors involved in property insurance. Here in the following chapter the six different inadequacies that could actually prove costly are being discussed. A homeowner or property holder needs to assess coverage on regular basis to keep up with intensifying additional costs. But covering different kinds of homes or properties in different locations postures additional difficulties. If you purchase insurance from more than one provider, you then may face conflicting instructions, limitations, and policy renewal times. For illustration, the liability limit on the policy for a second home might fall below the minimum on an excess liability policy intended to complement the insurance on your primary home. You could wind up accountable for the difference. One perk of affluence is the means to own exceptional homes; one downside is that they may be difficult to insure satisfactorily. Average homeowners’ coverage normally won’t pay for the materials and craftsmanship required to reconstruct that 19th century showplace you’ve scrupulously restored. Seaside homes may face cyclone damage, while some other places could be subject to earthquakes. In the meantime, city co-ops or condos may need policies tailored to their buildings or associations coverage. Ordinary homeowners policies limit coverage for the losses of antiques, furs, and other valuables. And while you could schedule additional coverage, insuring the real value of a collection of contemporary art or vintage muscle cars likely will require a specialized policy addressing several critical issues. Will a damaged or destroyed item be paid for with cash, or will you be required to have it replaced or restored? Will additions to your collection automatically be covered? When somebody works for you or your family, as a baby-sitter, watchman, personal assistant, or in another role, you could be liable for medical expenses and lost wages if the worker is hurt on the job. Several countries require household employers to pay into a worker’s compensation fund, while in other countries it’s non-compulsory, but providing such insurance may be mandatory for ensuring your financial well-being. Extra liability coverage could help protect you if you’re sued as a director of a nonprofit’s board. Or for more comprehensive protection, you may want to consider special directors liability insurance. Your financial life isn’t static, and neither are your insurance needs. The value of a collection may increase; extensive home renovations could mean a sharp rise in the value of your property; and the re titling of assets as part of your estate plan—or because of divorce, a death in the family, or the birth of a child—could demand policy changes. Even lacking major events, you probably need a comprehensive review of all your insurance coverage at least once in two to three years.